The day our little girls have their first period is a powerful moment in their lives. Unfortunately many dads mess it up. If we know how to be a good dad on this day it can make a huge difference in their life as a woman. Unfortunately most dads don’t know how important they are and leave it to the moms to handle this transition. This week’s video will give you the simple steps to make this one day a powerfully positive experience that will effect your girl for her whole life. When our little girls grow into women and start to bleed, it is an amazing moment in their lives. Unfortunately, few of us fathers know what to do in this precious moment. A lot of us back away thinking we should leave it to the women. This can lead to long term detrimental effects upon our daughters. If we know how to be the father they need, we can make it a profound transition that leads to them becoming a more empowered woman throughout their life. We are taught that the menstrual cycle is something to leave for the women to take care of. This has a long term effect on women, as it takes women many decades to come to the place where they feel good in themselves as a sexual being. If we know how to be with them in this moment of transition into womanhood, we can give them the message that all of who they are is good. They can more quickly get to a place of feeling fully empowered in who they are. Here are four keys that you can do to have this moment be a wonderful moment and not a bad lesson. Key #1 Don’t Assume It’s a Woman’s Thing! The most important and quite simple step is to not assume it is a woman’s thing, to get in there and incorporate yourself. Learn about the experience, talk to your partner about it, get educated, and engage in the moment. Do not assume that you should remove yourself in that moment. Key #2 Know Thy Self & Deal with It! If we want to fully incorporate ourselves into our daughter’s lives, then we have to notice what’s going on for us internally. If we have any mixed feelings about our daughter’s transitioning into becoming women and becoming sexual, then those unconscious mixed feelings can cause us to back away. Many us have shame about your own sexuality or unaddressed fears about our daughter being sexual. Our culture doesn’t help us much with being consciously empowered in our sexualities and thus our children need all our help to not go down the normal disempowered path. Transitioning into womanhood and puberty is a really intense experience for girls. If we as fathers back away in that moment rather than being close, they really lose the support that they need. If we can step forward and maintain our proximity, they will be able to transition through this period of life with much greater ease and move into a life where they feel good about themselves. Take the time to get in touch with your own inner feelings about this transition. Talk to your partner, journal, perhaps a friend, or just sitting there with a cup of coffee and thinking about it. Notice what is happening inside of you, so that your inner feelings do not end up dictating your relationship with your daughter and you can continue to have a close relationship with her. I keep saying this because it is extremely important. We need to stay in physical contact with our daughters. As they transition in their bodies, it’s really helpful for them to stay in physical contact with us. Whether it is rough housing, wrestling or however you did it with them when they were younger. Do not stop doing that just because they have breasts that are budding, and their hips are spreading out. They still need that contact and if we suddenly withdraw this connection and affection, then they get the subtle message that I discussed previously. If we are there for them to cuddle up against and be close with, they get to experience their developing eroticism in a very healthy way. If we back away, it gets very confusing for them. Stay there and continue doing the things you have always done. They will really appreciate you for it. Key #4 Celebrate the Day! When the day comes when your daughter bleeds for the first time, make it a day of celebration. It does not have to be all touchy-feely and sharing of what is going on for her. She will probably feel very awkward and nervous. Just make it obvious that you think it is a great thing. Ideally, you and your partner can take her out, do something that is special for her. Perhaps a simple piece of jewelry. These acts show her that you think it’s wonderful that she is entering into this new stage of life. Thank you for joining me for another episode. 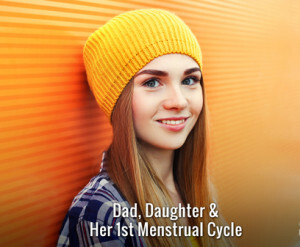 I would love to hear how you have navigated your daughter’s first cycle. Please join the conversation below. I’ll see you next time for another episode.